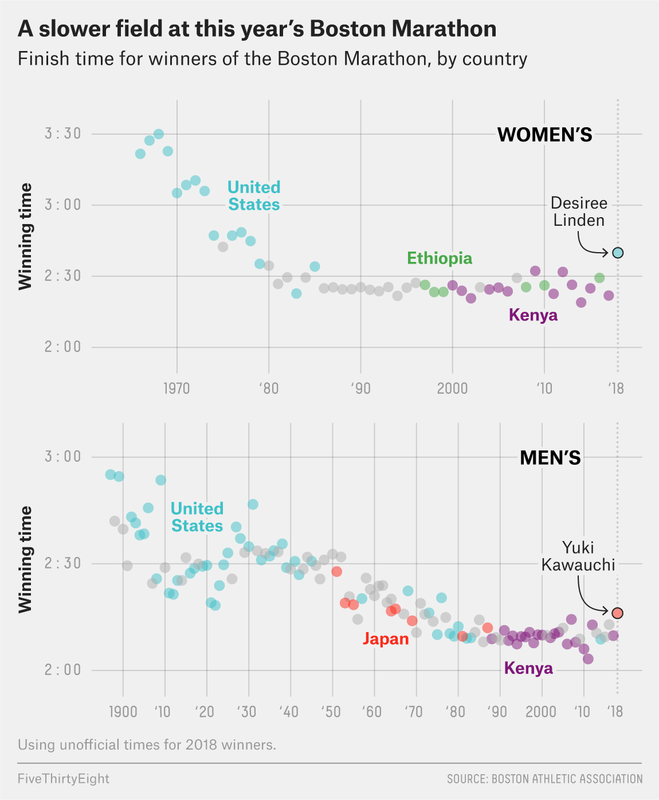 For more than 20 years, the first man and woman across the Boston Marathon finish line have almost always been athletes from Kenya or Ethiopia. But it was an American woman and a Japanese man who won this year’s open divisions. Desiree Linden was the first American woman to win since 1985, finishing in 2:39:54, the slowest winning time since 1978. The men’s field was similarly sluggish — Yuki Kawauchi’s winning time of 2:15:58 was the slowest since 1976. One likely reason for the unusually slow finishes? Runners faced heavy rain, headwinds and the coldest marathon temperatures in 30 years. Kawauchi was loving the cold, though. “For me, these are the best conditions possible,” he told reporters after the race.